This past Wednesday and Thursday we had the guys out for the first of three “weekends”. I would say we got a lot done. The first day we finally fixed the rest of the wall. After trying very hard to NOT completely rearrange the tires, we rearranged the tires. By the end of the day the wall was back to where it was before the monsoon caused it to collapse. The second day we lost one of our four guys. That’s ok. We had one less person to pay on Thursday and we have the opportunity to hire someone else next time. Hopefully we don’t lose more people. The second day was hard. Very hard. We added a whole new layer. The wall is now 6ft tall. My finger got in the way again. I’m not the best at taking pictures. Friday and Saturday was spent with me adding all the rest of our usable tires to the next row and filli the first 6.5. Tomorrow it is supposed to rain, so instead of filling tires I will be collecting new tires and adding them to the next layer (the layer that will bring this to 7ft). I’m tired. This is currently my view, from 7ft high. It’s pretty nifty, and a little scary. 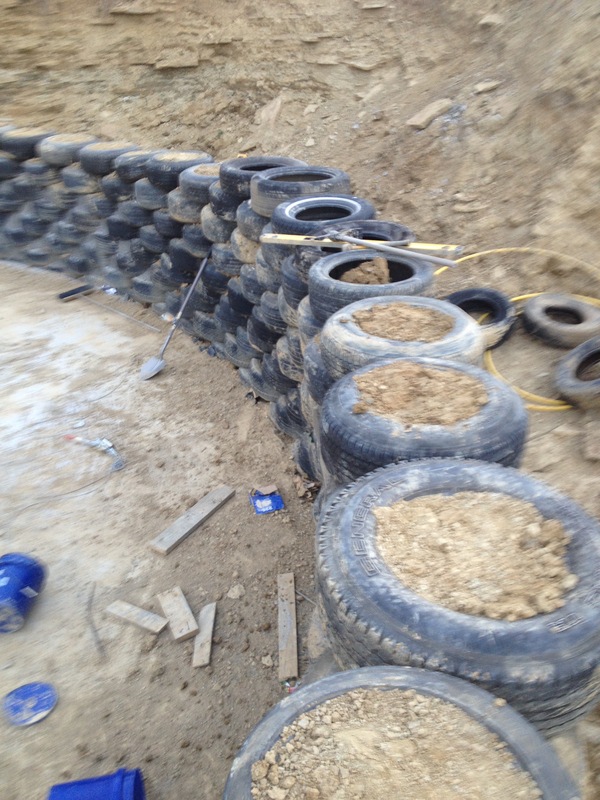 We spent the past few days concreting in between the tires on the interior side of the wall. Please disregard the giant finger in the way. 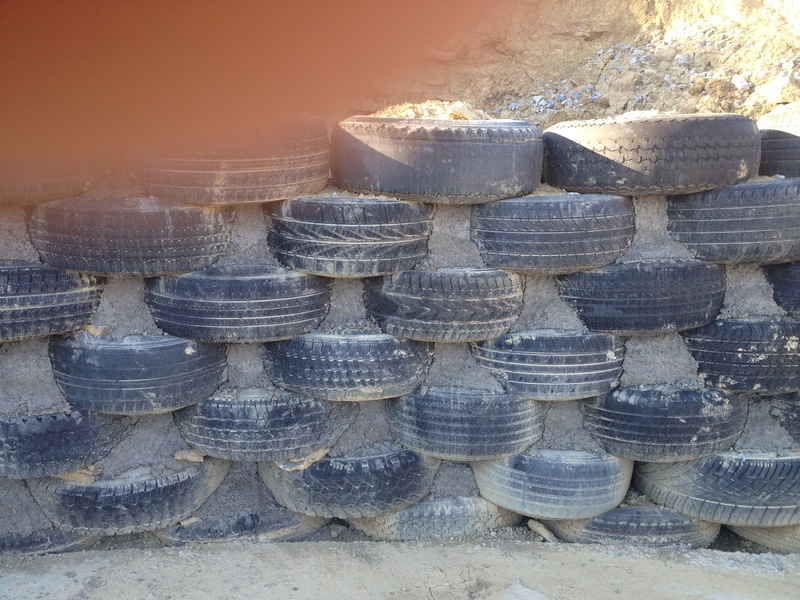 The actual earthships have Adobe filled in between the tires but with the high rainfall in Kentucky we chose not to use this method because it would become unstable. Once again we encounter the coulda, woulda, shoulda. We should have had the forsight to realize that we needed to use concrete instead of Adobe and not decide to skip the step all together. We didn’t fill the entire gap with concrete. We filled the large spaces with cans and such to decrease the amount of concrete used. It makes entire structure much more stable and we don’t use nearly as much concrete. We also replaced all of the tires on the fourth layer. At first we tried pulling the tires up by first removing the dirt from the middle and then using a winch. After 20 minutes we finally got one tire back up and decided to try something else. We then rolled the tires around to the concrete pad and up a ramp. After 2 tires were put in place in less time than the first tire was put up using the winch we decided the ramp was probably the best way to go. We will see on Sunday if this still works as the best method. 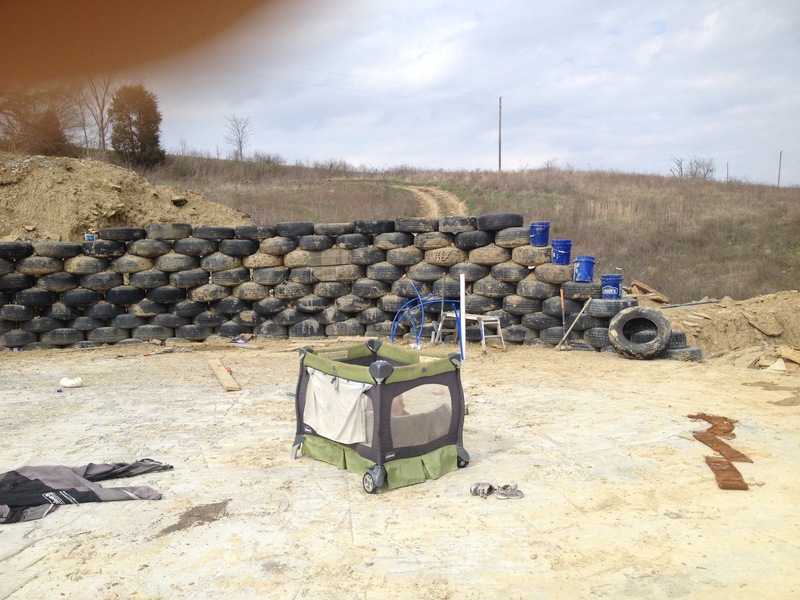 We have been planning to hire 4 guys to come out and help us finish the tires. 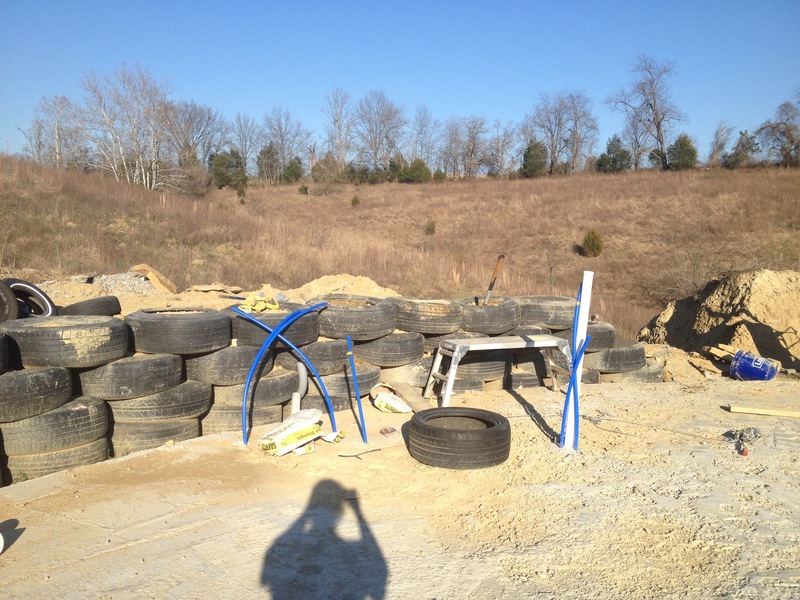 We have the whole thin worked out to where the tires should be finished by the end of April. On one condition: it stops raining on the days C is off work. It never fails: it will be dry all week and then we will have a major downpour on either Tuesday, Wednesday, Thursday, or any one of those days individually. The guys are supposed to come out next Wednesday and Thursday and guess what? They are calling for thunderstorms. We will finish. I know we will finish. Hopefully. Two important things happened this week. 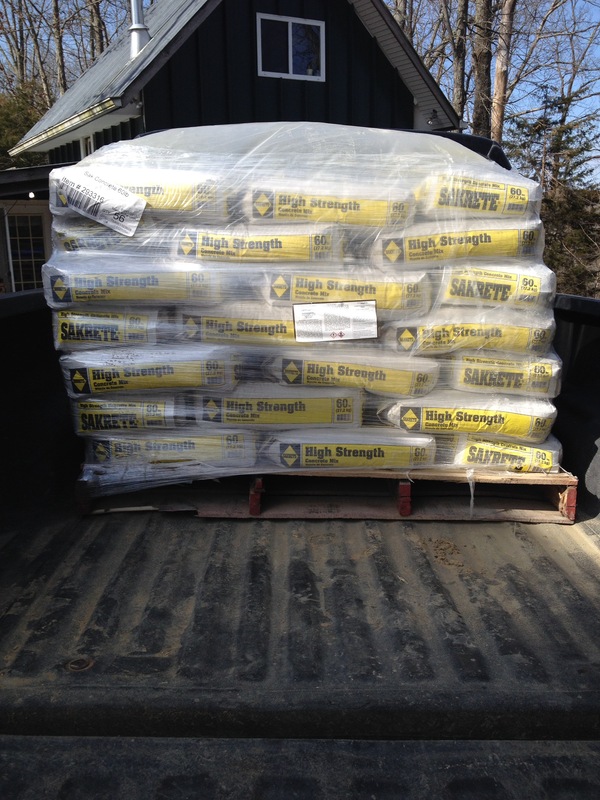 The first is, despite all the rain, we bought 2 pallets of 60lb bags of concrete. These will be used to reinforce the tires that we had to fix and will be used to frame up the front door and possibly the framing for the greenhouse (although we may have a truck come out and pour that for us). My plan is to have the tires stabilized enough for me to start filling tires by the end of this week. The second piece of news is that we have decided to hire 3 guys from C’s work to come out every few weeks (for a total of about 6 days in all) to get at least 1 layer of tires up per day. We should be only 11-12 layers away from being done. With this we should have the tires done by mid May at the latest. It cuts into our budget but it’s totally worth it.